"We've gotta start thinkin' beyond our guns. Those days are closing fast." In July of 1969, Sam Peckinpah's The Wild Bunch burst into US theaters, creating a fervor amongst film critics and ticket-buyers alike. Introducing sustained slow-motion violence, complete with graphic depictions of men bleeding profusely from gunshot wounds, Peckinpah essentially took the American western into the jungles of Vietnam. Peckinpah's violent, gritty exploration of humanity divided audiences during its theatrical run, and the impact of the film cannot be overstated. Simply put, this tale of unforgiving outlaws changed cinema forever. The Old West is coming to a close thanks to the railroads and modern mechanizations such as automobiles and machine guns. What once was uncharted territory, ruled more by man's primal instincts than his ideas, has quickly become part of mainstream American society. In such conditions, Pike Bishop (William Holden) and his bunch play out their existence as endangered species. The film's opening scene is a staggering accomplishment in filmmaking, as Pike leads his men into town for a high-stakes robbery only to be trapped by bounty hunters. Bullets rip through the town, interrupting a church service, and the human toll is costly. Many in Pike's crew die in the visceral gunfight, but the principal members escape and ride off into the desert. Mr. Harrigan (Albert Dekker), a wealthy railroad baron looking to rid his company of this band of outlaws, is not about to let them get away and sends his ad hoc law enforcement team after them. Leading the charge is Deke Thornton (Robert Ryan), Pike's former partner, who had been arrested years before and who now gives his word to Harrigan that he'll lead the bounty hunters to the bunch in exchange for his freedom. Escaping to Mexico, Pike informs the others that Thornton is on their tail. Dutch (Ernest Borgnine) remains loyal to Pike, but Lyle and Tector Gorch (Warren Oates and Ben Johnson, respectively) become disillusioned after the robbery results in a worthless booty. Things are not as they once were, but new recruit Angel (Jaime Sanchez) saves the gang by opening their horizons to a life beyond the barrel of a gun. Ultimately, Pike and company are unable to leave their tendency for violence in the dust and begin work for the tyrannical Mexican general, Mapache (Emilio Fernandez), on what is to be their last job. The script, by Peckinpah and Walon Green from a story by Green and Roy N. Sickner, is not your quintessential western. In the usual western, Thornton's pursuit of Pike would be the narrative's driving force. Here, Peckinpah uses it as the thematic core of the film, but barely pays attention to it in terms of action. While the outlaws takes refuge in Mapache's quarters, despite Angel's hatred towards this oppressor of Mexican liberty, the bounty hunters quarrel more with one another than their targets. It is in the exchange of dialogue, I think, where the film proves its greatness, not in the voluminous action set pieces. These are bad men, but they have their own code. Loyalty, keeping your word, and a tragic sense of loss loom deeply in Pike's soul. As he accepts Mapache's offer, which entails traveling back to the US to steal military weapons, Pike makes a fatal mistake by letting Angel use a case of guns to arm his own village against Mapache. This simple act of loyalty may represent Pike's atonement for abandoning Thornton years earlier, but it also moves the film into a bloody climax of loss, redemption, and emptiness. Peckinpah's masterpiece is a deeply challenging film made by an artist at the height of his powers. Shortly after its release, the studio edited out the film's flashbacks and robbed much of its heart in the process, since these scenes unlock the history of the characters. Thankfully, Peckinpah's original vision received a full restoration in 1994 and its power is so raw, so authentic that the MPAA actually gave it an NC-17 rating (upon appeal, it was re-rated R). In light of today's films, the violence is not nearly as shocking as it once was, but it is still quite effective. The final shoot-out is one of the greatest scenes ever made, being both entertaining and disheartening. The men enjoy killing one another, the audience enjoys watching it. Made at the height of the Vietnam War, Peckinpah reminds the audience that the violence of the Old West is replaced by the New West's violence by intercutting close-ups of children with the mayhem around them. As evidence of the film's effect on subsequent work, see GoodFellas, for which Scorsese borrows this motif.Watching The Wild Bunch again, I am struck by how well Peckinpah uses the violence to reveal character. Despite being intensely graphic, the film is never gratuitous; there are only three scenes of major bloodshed. Instead of creating a run-of-the-mill adventure, Peckinpah and Green have crafted a script that is an exploration of mankind's nature. With William Holden giving what I believe to be his greatest performance, Pike Bishop is the crux of the film's themes about life and death, darkness and light, good and evil. I don't pretend to know everything Peckinpah is going for, largely since his symbolism is subtle and ambiguous, but it seems that no stone is left unturned here. Many scenes play out in silence, such as near the end when Pike sits in a prostitute's room thinking of the life he's led, and reveal a depth not normally found in motion pictures. These are real people, full of complexities and secrets the viewer will never fully understand. With Holden in the lead, the ensemble here is absolutely stellar. Ernest Borgnine gives one of his best performances as Dutch, playing a man 180-degrees from Marty. There's an intensity in Borgnine's face that seems lacking in his other work, creating a character that is both intimidating and a good friend to Pike. Edmond O'Brien, playing the oldest member of the gang, Sykes, works as a perfect compliment to the two principals. Warren Oates and Ben Johnson are excellent, creating some raucous fun as the Gorch brothers, while Jaime Sanchez turns in a quiet performance filled with integrity. Robert Ryan is also tremendous, often working without dialogue, and creates a skillful portrait of America's transition from the Old West into the 20th century. The supporting cast provides an eclectic mix of characters, like the comic relief of L.Q. Jones and Strother Martin as two wretched bounty hunters, who aid the film in its attempts to authenticate the story. There's a timeless quality to the film that allows it to flourish. Using the western genre, Peckinpah tells a story of great conviction about the follies of man. Yet this is not merely a pessimistic diatribe, but a rousing spectacle. On a technical level, this film has few equals. Lucien Ballard's cinematography is breathtakingly bold, with gorgeous deep-focus shots and ferocious zooms that mix together in creating a deeply textured picture. His compositions capture Edward Carrere's gritty, detailed production design wonderfully. The 2.35:1 ratio is masterfully conceived, combining long shots and close-ups all with a single frame. Jerry Fielding's score is quite revolutionary, not following the norms of the American western, and reaches into the story's themes. Under the guidance of Louis Lombardo's editing, the filmmaking creates a taut epic. Image Transfer Review: Previously released in a skimpy edition featuring a nonanamorphic transfer spread across two sides of a DVD-18 disc, Warner redeems themselves here. This picture is absolutely stunning and I cannot imagine the picture looking any better. Apart from a few scratches and a bit of dirt, the picture is perfect. Any flaw in the transfer can be attributed to the source material. Blacks are luscious and deeply textured, colors vibrant, detail sharp, and the whole picture has remarkable depth. Mosquito noise, edge-enhancement, and compression artifacting are nonexistent. This is one of the most beautiful DVDs I've ever seen. Audio Transfer Review: The Dolby Digital 5.1 audio is also quite good, with the rear channels well utilized to engage the viewer. The mix does not alter the source material much for a 5.1 track, paying homage to the film's sensibilities while also utilizing the home theater well. Jerry Fielding's score permeates from all directions, livening up the soundstage and really creating an enthralling experience. The major action sequences also sound good, with gunshots ringing from everywhere and some nice instances of sound separation. Dialogue is always discernable and balanced, though I noticed two brief occasions in which hiss is present. It's not distracting, but keeps the mix from being perfect. A French Dolby Stereo 2.0 mix is also available. Never-Before-Scene Outtakes—a collection of various bloopers and alternate takes. Extras Review: The special features make this two-disc set all the more impressive. There is an audio commentary by Peckinpah biographers/documentarians Nick Redman, Paul Seydor, Garner Simmons, and David Weddle. The four are fountains of information, giving interesting facts about events on the set, as well as the movie's context in Peckinpah's life and career. Each man truly respects and admires this film, which feeds into the comments of the others, creating a festive tone. Everyone offers keen insights into the various bits of symbolism in the film and, while I think they are overreaching some of the time, offer a very comprehensive look at its themes. 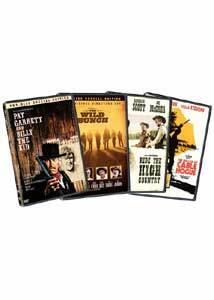 Also located on Disc 1 is a collection of theatrical trailers for the film, as well as Peckinpah's Ride the High Country, The Ballad of Cable Hogue, The Getaway, and Pat Garrett and Billy the Kid. A trailer for Warner's The James Dean Collection is also presented and each trailer is shown in nonanamorphic video. Moving over to the second disc, a reel of Never-Before-Scene Outtakes (08m:45s) play without production audio in 2.35:1 anamorphic widescreen. For the most part, this just seems to be a collection of alternate takes not used in the film for some of the bigger set pieces, though on occasion you can see crew members come in and animals fall out of line. This isn't a gag reel like most outtakes are, but a brief look at the making of an important film set to Fielding's score. However, the real delight in this set is the collection of documentaries located on Disc 2. First is the Academy Award-nominated documentary, The Wild Bunch: An Album in Montage (33m:28s), by Seydor and Redman. Consisting of footage from the set of the climactic gun battle as well as clips of the film, this documentary offers a great amount of insight into the filmmaking process. Audio clips of Ernest Borgnine, Warren Oates, L.Q. Jones and others (including Ed Harris enacting Sam Peckinpah) give a great feel for what the actual production was like. If you are interested in this film, or the filmmaking process in general, do not miss this documentary. Following this is Sam Peckinpah's West: Legacy of a Hollywood Renegade (01h:22m:34s). Narrated by Kris Kristofferson and consisting of interviews with the above-mentioned biographers and film critics Roger Ebert and Elvis Mitchell, as well as James Coburn, Paul Schrader, Benicio Del Toro, Billy Bob Thornton, Peckinpah's sister Fern Lea Peter, and many more, this is an excellent portrait of Peckinpah as a troubled man and brooding artist. His entire career as a director is covered, with emphasis on his work in the western genre in particular. Everybody comments on the various facets of Peckinpah's life and work, making a thoroughly informative and comprehensive documentary. Rounding out the special features is an excerpt from A Simple Adventure Story: Sam Peckinpah, Mexico, and The Wild Bunch (23m:45s). Following the four men who provided audio commentary for the DVD, as well as Peckinpah's daughter Lupita, the documentary chronicles their visit to the set where Peckinpah filmed the final gun battle. This really seems to be more of a grand gesture by fans of the film than an attempt to delve into Peckinpah or The Wild Bunch, especially since Lupita is barely in the excerpt. Maybe the full documentary has something more to say, but this excerpt really amounts to four guys professing their love and knowledge of a movie near and dear to them. These extras supplement the film tremendously and offer a picture of Peckinpah as a man and an artist. The Wild Bunch (The Original Director's Cut) is a stupendous achievement. Film buffs can appreciate the film's glory thanks to a marvelous, new anamorphic transfer, spiffy sound mix, and excellent special features. Words cannot fully describe the importance of Sam Peckinpah's glorious masterpiece, so simply rejoice in this wonderful DVD courtesy of Warner Home Video.